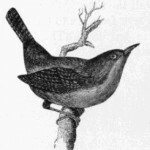 A growing collection of vintage wren drawings. The little house wren is such a happy little bird in our garden. Their talkative nature and their characteristic upright tails make them a favorite of ours. I hope the wren images in this group will be useful for your next arts and crafts project. 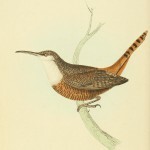 The bird in this vintage book plate was identified as a white breasted wren. The name might have changed since 1829, but the drawing is still quite lovely. 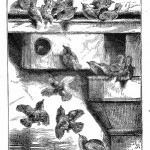 A group of wrens gather around a roof-top nesting box. 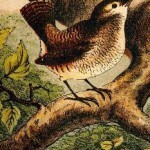 Full color drawing of a wren on a branch. Beautiful vintage, black and white wren drawing.